It is probably all too obvious based on the number of recent book review posts that I am dealing with the flu. Which was fine during the Olympics – online replays left me thoroughly entertained – but afterwards I turned to my big stack o’ books to fill the hours. 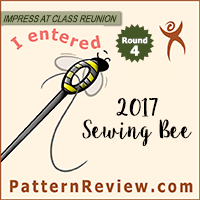 It is one of those lingering sorts of things – where I have enough energy to be board easily, but not enough to actually deal with sitting at the sewing machine. Taking my soup bowl to the kitchen is exhausting. So I sit. And I nap. And I read. 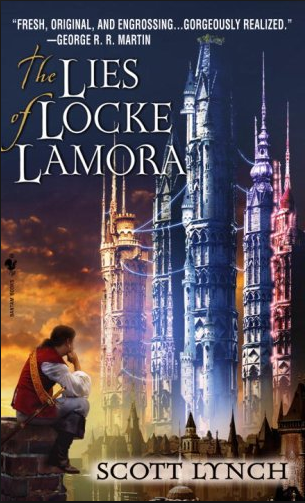 I first heard about The Lies of Locke Lamora through the Sword & Laser book club podcast, almost a year ago. At the time I thought it sounded like fun and put it on my mental list of books to check out. Then, a few months ago, a friend recommended it so it jumped up a bit higher on the list. I started reading it at the end of December, and have had to set it down and pick it up several times since then, as other books have jumped to the forefront. I’ve finished, but I am a bit conflicted in how I feel at the book’s conclusion. The Lies of Locke Lamora is part fantasy, part mystery, and part heist. Locke Lamora has been trained since his youth to run the city’s high class gang of thieves, The Gentleman Bastards. He is in the middle of a particularly well thought-out plan when the natural order of the city is disrupted by the arrival of the mysterious Grey King. Locke and his friends must solve the mystery in the attempt to prevent total chaos from descending on the city of Camorr. I have to say I am not entirely sure how much I really liked this book. 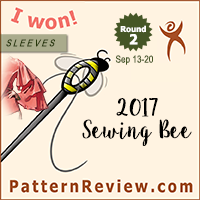 Perhaps it was my flu-induced ADD, but I found myself oscillating between being thoroughly entertained and mildly bored. Normally I am one who loves descriptive passages, and the world of Camorr is wonderfully different from so many other fantasy realms, yet by the end of the story I was getting tired of what I felt were repetitive explanations. I will say that I did love the interactions between the Gentleman Bastards – my only complaint is that there weren’t enough of them! Perhaps I am just a sucker for the large group of friends working to pull off a bit of sneakery, but I really wish we had gotten to see more interactions of the team plotting, planning, and working together. The tone of the story runs from good-natured jesting between the Gentleman Bastards to rather explicit violence between mortal enemies. I have to say I am not one to be put off by violence or offensive language in books, but for some reason I didn’t feel like they naturally flowed in this story. I found the tone of the characters to change too often at odd times. Granted, as con artists, that should be something they are quite skilled at, but the timing of it made the main characters feel too inconsistent. Their use of language kept throwing me out of the story and into modern day. Well, that and everyone’s need to give lengthy exposition on their terrible sad childhood. I mean, giving people terrible sad childhood stories is a great way to build a character – but I don’t necessarily believe they are all going to sit around and actually talk about it after beating the crap out of each other. I will say that the end of the story was quite exciting though – which conflicts my feelings even more. With about a hundred pages to go I was reading just to finish it, but with about sixty left I was reading because I wanted to know what was going to happen. The conclusion was satisfying, though this story did leave several important things unanswered (well, really, barely touched upon them at all), which I suppose is a good way to convince us to read more of the series. There has been talk on the internets about the possibility of this becoming a movie. I have to say I actually think it would make a much better TV show than a full length film. Partially because I feel like it would be difficult to reduce all of the nuances of the plot to only a few hours, but also because the way Scott Lynch breaks down the chapters feels very episodic and almost soap-opera-esque in style. Also, I think the “mystery” portion of the story would play up better over the course of a season rather than in the time constraints of a film. I don’t know if it would be possible to retain quite the… flavor… of the characters in a TV series, but I think it would be better for developing the overall mystery and plot. Especially if it were taken on by a network like HBO. Normally I am on team “The Book is Better,” but in this case I might actually be more excited by a well done television series than I am by the novels. I would definitely love to see the world of Camorr on screen though – be it big or small. So, I don’t know how I feel about the first book of the Gentleman Bastards series. I suppose I did enjoy it, off an on, but I also didn’t feel like the story was quite as tight as I wanted it to be. I liked the characters, but I never really fell in love with any of them. I still have a lot of questions about their pasts, but I am not sure how much time I want to put into finding out the answers. Also, I can’t be entirely sure how much my hesitation comes from having to read the book in pieces, how much from having the flu, and how much from the writing of the book itself. This might be another book I have to file under the “written for dudes” category. Certainly a lot of things I can see some of my male friends getting really excited about that sort of left me disinterested. I mean, I think there is enough interest for me to pick up the second book in the series, Red Seas Under Red Skies, but probably not right away. Definitely want to give the series another shot, but I am going to wait until I am no longer suffering from flu-induced ADD brain fog, and until I have time to sit down and read it without lengthy interruptions. Which might be a while considering that Sword & Laser just announced the March pick (Altered Carbon) and Brandon Sanderson’s massive Words of Radiance comes out next week!